Since NAPLAN was introduced ten years ago reading and numeracy have improved slightly and writing skills have gone down and despite all the resources that have been invested in our system of education we haven’t hit the lofty heights of excellence we were hoping for. 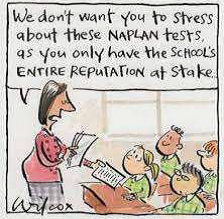 School performance in NAPLAN it is accepted, reflects best teaching practise so teachers and students are under considerable pressure to perform. Teachers are under pressure to perform according to set guidelines and this can be confirmed in casual conversation with educators in any school setting. I won't expand on the link between neo liberal policies and its effects but suffice it to say I do believe that the work of the teacher is very much linked to an agenda that is far removed from the classroom and the experience of the teacher and learner in the school setting. How does this continued spotlight on the teacher effect general health and wellbeing? I would like to consider this in the light of the REBT (Rational Emotive Behaviour Therapy) counselling model. 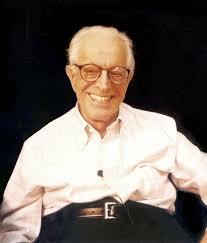 Albert Ellis’ ABC Theory of Emotional Disturbance embodies the wisdom of many thinkers over the millennia e.g. 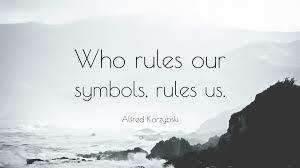 The Stoic Philosophers, Karen Horney, Alfred Koryzybski and others. The ABC Theory is a philosophy based counselling model which posits that when something happens (A) there is a behavioural and emotional consequence (C). The children I work with often have an A=C philosophy which says ‘I am angry (C) because she said I couldn’t join in (A)! Ellis said that how we feel and act at (C) can be regulated by how we interpret/perceive/estimate what has happened at (A). This part of the equation (B) alerts us to the cognitive component which drives the strength of the emotion we feel and the kinds of behavioural choices we make. In the counselling situation we want to help the student move form an A = C philosophy to an A x B = C philosophy or way of thinking. This helps the child/adult understand that he/she is an active agent in making feelings and choosing behaviours. If a person’s worth is challenged and questioned incessantly either explicitly or by implication this can begin to unsettle a person’s view of self. This in turn will affect how the person deals with difficult and challenging situations, the (A) part of the equation. Confidence is an essential personal quality that is a buffer, a protective factor against the adversities that we all inevitably are called on to deal with. It is constructed over time and like a wall which is well constructed it will be tested by all manner of assault and if it’s strong it will prevail. However even the strongest of walls can be breached and compromised to the point of failing. What is confidence? It’s a way of behaving, a projection of a certain sense of comfort with oneself that allows for healthy risk taking to work towards set personal and professional goals. She who feels confident will also deal with adversities constructively. What we see behaviourally and emotionally and which we call confidence is underwritten by an internal, deeply placed habit of thinking/believing. 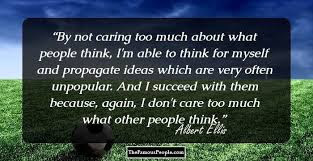 It is what Ellis calls ‘unconditional self-acceptance’ a steadfast belief that one cannot be defined by the opinion of others or how one performs in a general sense. In other words someone’s idea about you does not and cannot define the essence of who you are. Nor can failing at a task define you as a failure. This is the ‘psychological wall’ of self-acceptance constructed over time. However the foundations of this belief can be rattled under the weight of persistent judgement and appraisal based on ‘key performance indicators’ in a regime of testing and accountability which is so much the reality of the teaching and learning experience according to many. I regard this ‘new subjectivity’ to mean a shift in the foundation belief of unconditional self-acceptance to a new and shaky assessment of self to be a conditional one. This habit of thinking /believing i.e. ‘I am only OK if … my kids perform well, if my line manager thinks I’m going OK, if the regional director is happy with how the schools heading etc. Self-doubt may creep into her mind about her ability to ‘be’ a ‘good’ teacher. What do her colleagues think of her? Will she be asked to enter into some capability building exercise to bring her up to standard? And how will others view this? Albert Ellis would say that the teacher has shifted from a position of strong self-worth to one of conditional self-worth where she only feels validated when she meets the expectations of a teaching regime that is laid out before her. What can she do? She can challenge the status quo and articulate her concerns about how things are going and how she feels about things. But how will this be received? She may think that she will be regarded as ‘the problem’ and that she will have to lift her game. She will have to lift her level of expertise to that of the ‘good,’ the ‘quality’ teacher. Is there a place for constructive criticism to be expressed without fear of judgement? Is there a sense that what people have to say is valued? 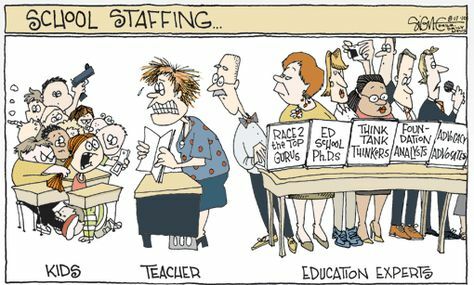 Teacher mental and overall health and well-being is challenged in the present climate of teaching and learning. The culture of performativity can for some, undermine their sense of confidence where their view of self is challenged because the system says they’re in effect no good! This is typical of conversations I've had over the years working with young people. From early childhood to senior high school age the theme of most topics relates to the idea of 'being' and 'doing.' This exchange serves to illustrate the point that somehow Fred has decided that what he does is indeed who he is. The notion that one 'is' good or bad is an errant one which can harm the emotional and psychological well being of the person who holds it to be true. Ellis seeks to remind us that we are human beings who can act in ways that are 'good' or 'bad' but we are not what we do. OK Fred is not OK! Fred's condition of naughtiness is problematic because this is why he has been excluded from the classroom and he feels bad. Counsellor: What does that mean? Child: I keep interrupting. I'm bad. Counsellor: You are naughty for interrupting? That makes you bad? Counsellor: So you are naughty Fred? You are bad Fred? Fred has decided that his naughtiness is linked to badness. Doing is being! Child: I’m bad Fred because I do bad things. Counsellor: How does that make you bad? Child: I am bad because I interrupt a lot and the teacher doesn’t like it. Counsellor: If you do things people don’t like you are bad. Can bad Fred be good Fred? Bad Fred does things the teacher doesn't like. He wants the teacher to like him because what he does is who he is. Child: Yes. When I don’t interrupt I am being good. Counsellor: So there is good Fred and there is bad Fred. Is that right? Child: Yes. When I’m good the teacher likes me. Counsellor: People like good Fred but they don’t like bad Fred? It sounds like you are two people, bad Fred and good Fred. Child: I’m not two people at the same time am I? Counsellor: Well no. That’s why I am trying to understand what you are saying about yourself. Child: I am Fred and I can be bad and I can be good that’s what I mean. Counsellor: So when you do something the teachers like you are Good Fred but when you do something she doesn’t like you are Bad Fred. Is that right? Here we are trying to get a sense of what doing is and what being is. Are they the same? Child: No I’m just Fred!!! I am Confused Fred! Counsellor: You are Confused Fred who can be Bad Fred and Good Fred! That’s three Fred’s! Only joking Fred. When you said ‘I’m just Fred’ I think you speak the truth. There’s only one Fred and you are he. There’s no other like you. Fred is unique. 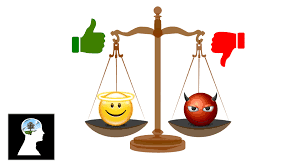 It is impossible to rate his worth totally good or bad based on a particular characteristic or behaviour. Counsellor: Ok. Doing something ‘naughty’ like interrupting is a behaviour. It’s something you do. It’s an action. Does that make sense? Child: Yes I understand what you say. Counsellor: When you say ‘I am bad because I interrupt the class you believe YOU are bad because you made a bad choice. Doing something is not the same as being something. We are making a clear distinction between doing and being here. Child: So I am not bad but my actions might be bad is that what you are saying? Counsellor: Yes. You are OK even when you ‘do bad’ or when you ‘do good.’ So can you be Good Fred and Bad Fred? Child: No. I am Fred. I am worthwhile Fred. I am OK Fred who makes mistakes but I'm always OK. This establishes that Freds worth is never contingent on a particular behaviour or personal quality or characteristic. Fred is on the way to feeling better about himself but where did he get these ideas in the first place? When others judge your behaviour they connect what you do with your being or your 'essence' or as Ellis says your 'you-ness.' Who is doing this? The childs parents and teachers and other people in Freds life reinforce these ideas via the messages they send, verbally and otherwise e.g. simply by saying 'good boy' to someone who has done something well is conveying the idea that doing good equates with being good. The ideal student is one who does as he is expected and has the qualities and competencies desired to 'be' successful and to reach full potential. What are the 'technologies of the self' and whose 'repertoire' is the child reciting? 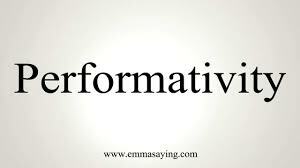 I take this to mean the kinds of discourse that characterises the culture of the classroom, this will include the types of feedback the teacher provides to behaviour observed, the attitudes and actions that the teacher responds to and therefore reinforces. The idea that a student could conflate being with doing is possible if a student is said to 'be good' when they 'do' something acceptable to the teacher. This idea is conveyed by telling children they 'are' good for 'doing' good. We can all take care to be aware that what we are saying when we are saying it is correct and conveys an accurate and useful message i.e. 'You did that well. Good job.' This refers to the actions of the person and not the 'essence' of who that person is.